The technology invented by psychiatrist Robert G. Heath in the 1950s and '60s has been described as among the most controversial experiments in US history. His work was alleged at the time to be part of MKUltra, the CIA's notorious "mind control" project. His research subjects included incarcerated convicts and gay men who wished to be "cured" of their sexual preference. Yet his cutting-edge research and legacy were quickly buried deep in Tulane University's archives. Investigative science journalist Lone Frank now tells the complete sage of this passionate, determined doctor and his groundbreaking neuroscience. More than fifty years after Heath's experiments, this very same treatment is becoming mainstream practice in modern psychiatry for everything from schizophrenia, anorexia, and compulsive behavior to depression, Parkinson's, and even substance addiction. Lone Frank uncovered lost documents and accounts of Heath's trailblazing work. She tracked down surviving colleagues and patients, and she delved into the current support for deep brain stimulation by scientists and patients alike. What has changed? Why do we today unquestioningly embrace this technology as a cure? How do we decide what is a disease of the brain to be cured and what should be allowed to remain unrobed and unprodded? And how do we weigh the decades of criticism against the promise of treatment that could be offered to millions of patients? LONE FRANK is an acclaimed science writer and the author of two previous books in English, My Beautiful Genome (Oneworld, 2011)--which was shortlisted for the Royal Society's Winton Prize for Science Books--and Mindfield (Oneworld, 2009). She has also been a presenter and coproducer of several TV documentaries with global distribution and is currently working on a feature-length, internationally financed, English-language documentary about Heath and deep brain stimulation. Before her career as a science writer, she earned a PhD in neurobiology and worked in the US biotech industry. She lives in Copenhagen. "Compelling... engaging... an accessible and entertaining description of this relatively unknown chapter in the history of DBS." "The Pleasure Shock is a page-turner full of fascinating characters, high-stakes drama, and profound ethical dilemmas. Lone Frank—a trained neuroscientist and gifted storyteller—illuminates the dark roots of a modern-day medical marvel, and her book should be required reading for anyone interested in our ongoing efforts to tame the human mind by tinkering with the human brain." "Scientists who are ahead of their time are often odd characters. Robert Heath is a dramatic example. Lone Frank brings his history and dramatic personality to life. She tells the untold story of his work on deep brain stimulation as a treatment for mental disorders. Was it pioneering or premature? Her nuanced portrait reveals Heath as a scientist-clinician who is neither monster nor hero, but passionate and persistent. I am astounded that I never knew this story despite decades in psychiatry. Others will be as fascinated as I am." 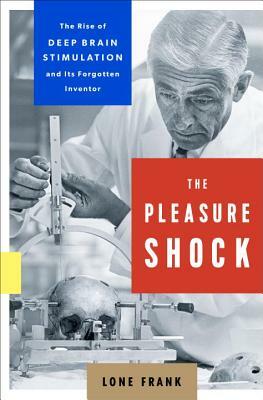 "The Pleasure Shock is not only a fascinating biography of brain-implant pioneer Robert Heath. It also explores a profound and disturbing question: Can we, and should we, use technology to eradicate suffering and evil?"